Great North Aleworks is a 20 barrel production brewery located in Manchester, NH. Founded by Rob and Lisa North, the brewery’s goal is simple – to craft flavorful, food friendly beers, while maintaining a fanatical devotion to quality. Our brewery and tasting room is located in Manchester, New Hampshire, just a mile off exit 6 of I-93. The tasting room is open to the public and designed to offer you an insiders experience. Where else can you see where our beer is made, meet the folks who make it and learn the stories behind each recipe? Visitors can tour the brewery, sample our beers, and browse the retail store for some cool Great North merch. We offer 4 oz samples, pints, and flights. We also fill 32 oz and 64 oz growlers with what’s on tap. Our 1600 square foot tasting room can accommodate over 50 people and is available for private functions. Please contact us to discuss availability and details. 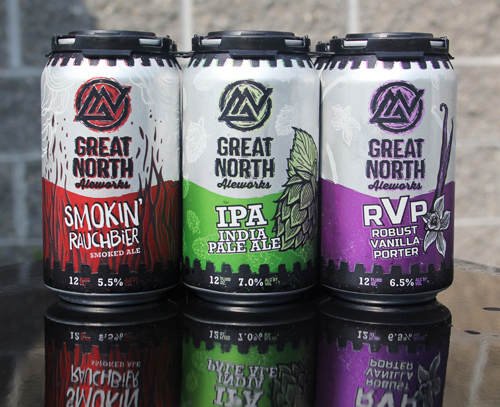 Great North Aleworks beers are also available throughout New Hampshire in cans and on tap. Please visit our website for tasting room hours and to see what's on tap.